Garlic not only makes food delicious, it may also have a number of health benefits. Some of these benefits are more likely if you eat your garlic raw, since cooking it may reduce the amounts of certain chemicals garlic contains. Before adding large amounts of garlic to your diet or taking garlic supplements, speak with your doctor as garlic can interact with certain medications and isn't safe for everyone in amounts greater than those used in cooking. People who consumed raw garlic at least twice a week experienced lower rates of lung cancer than those who consumed raw garlic less often, according to a seven-year study published in "Cancer Prevention Research" in July 2013. Garlic may also be beneficial for preventing or treating colon and pancreatic cancer, according to the University of Maryland Medical Center -- although research is still preliminary. Medical students who consumed 10 grams of raw garlic each day for two months significantly lowered their cholesterol levels, according to a study published in the "Journal of Postgraduate Medicine" in 1991. Another study, published in the "Pakistan Journal of Pharmaceutical Sciences" in October 2006, found that raw garlic consumption increased beneficial HDL cholesterol levels, while decreasing total cholesterol, although the difference wasn't large enough to recommend using garlic as the only method for lowering cholesterol. If you suffer from an inflammatory condition, it may help to consume raw garlic. A study published in "Food and Chemical Toxicology" in August 2013 found that garlic had an anti-inflammatory effect, with raw garlic exhibiting a stronger effect than garlic that had been heated. The levels of a compound called allicin were greater in the raw garlic, which is most likely the reason for its greater benefits. A decrease in insulin sensitivity increases your risk for Type 2 diabetes. Consuming raw garlic may help improve your insulin sensitivity, thus lowering your risk for diabetes, according to a preliminary study published in "Nutrition & Metabolism" in 2011. However, this study used rats, so further research is necessary to see if the same benefit exists in humans. 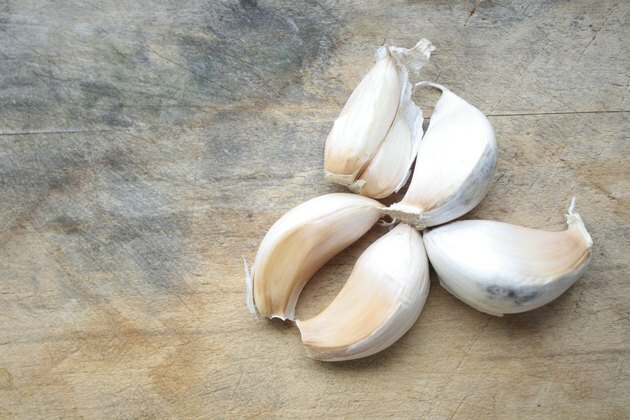 Can You Use Garlic for Strep Throat?